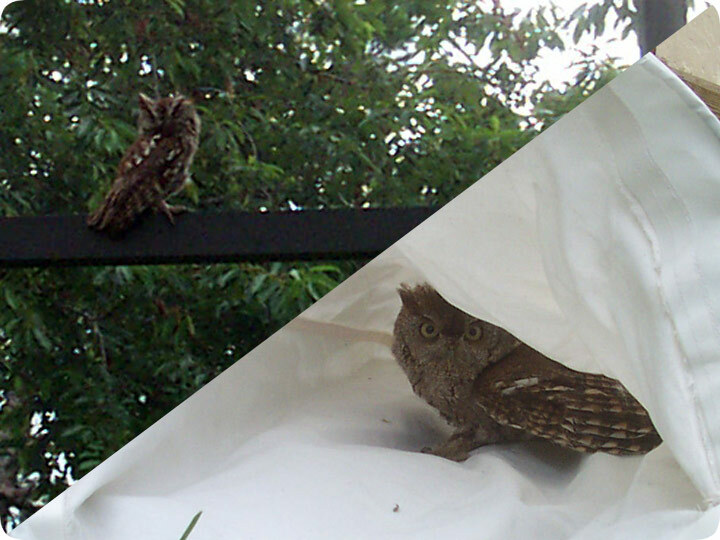 08.08.2003 - I got a phone call from a worried homeowner who informed me that she had an owl stuck in her screened-in pool enclosure, or lanai, as we call them here in Florida. I told her that I'd come out right away, so I did. I arrived, and found a small owl perching on the steel beam, as seen in the upper-left of the above photo. It was still and sleeping. I have a special heavy-duty canvas net that I use for certain wildlife removal scenarios. I got the net. I quietly sneaked up on the unsuspecting and sleepy owl. Then, with one swift and smooth swipe of the net, not unlike the one I've honed over my years as a butterfly capture specialist, I caught the owl! It flapped and hooted, in an attempt to escape the net. It could not escape. I brought it outside, and took the photo in the lower left. Then the owl walked out of the net, looked around, and flew off into the jungle. The world was safe again. But! For how long? This is the first time that I've ever dealt with an owl, and I don't expect that I'll have many owl jobs. However, I do hope to have many jobs in which I get a chance to interact with strange new creatures and get the job done quickly, such as in this case. This job was a real hoot. An owl is a nocturnal bird, meaning that they prefer to hunt at night. They will hunt for mostly insects and smaller mammals. They will also hunt other birds. They are found throughout the world except for the Antarctica and part of Greenland. They are mostly solitary birds. They have small beaks and big wide faces that are flat. They have large eyes that face forward on their face. The reason for that is because they are able to turn their heads all the way around. This way they can see what is going on around them from all directions without having to move a muscle in their bodies. They generally have tufts of fur coming from their ears. Generally, they will markings on their faces and their heads. They can’t see very well at a close distance but they have excellent hearing which makes up for this. There are different species in the owl family. The absolute smallest is the elf owl and the largest is the great grey owl. They all make different sounds which help them when finding mates or letting each other know a predator is approaching. When an owl hunts, it likes to sneak up on its prey and surprise it. They will kill its prey with its sharp, hooked beak and talons that are very powerful. They can crush the skulls of their prey with their sharp talons. They can fly without making a sound and their prey will often times not even know what hit them. An owl will lay between one to thirteen eggs. Their eggs are generally spherical in shape and are white or off-white in color. They don’t usually have any markings on the eggs. The female will lay one egg, wait two or three days and then lay another one. There are several species that make their nests in trees and some will make their nests in marshes. They will usually take over the nests of other birds so that they don’t have to build their own. The courtship of an owl will involve calling out to their mate and he will also try to offer her some food. They will usually mate for life. Baby owls are called owlets. They use an egg tooth to help them hatch out of their eggs. The youngest owlets will usually die unless food is plentiful to them. This ensures that only the strongest will survive and it keeps their species strong allowing them to survive. Owlets are blind when they are born and they have a very thin coat of feathers. They will grow a thicker coat over time. They may leave the nest as early as three to four weeks. They are able to breed within about a year of being hatched but some of the larger species may not breed until they are two years old. An owl is territorial. They will defend their nest and their surrounding feeding area. They will viciously attack an intruder that tries to either steal their food or bring harm to their eggs or young ones.